We’re happy to announce that we’ve teamed up with Night Vision Ops, Night Optics USA, and Ben Hansen to bring you exclusive deals on night vision goggles. Hansen, best known for his role on Syfy’s Fact or Faked, is the founder and president of Night Vision Ops, a Bushnell affiliated company. Night vision technology has been, and continues to be, an asset to UFO research and skywatchers world-wide. It is our goal to make it more feasible for individuals to access this technology in attempts to capture and better understand unknown objects in the sky. 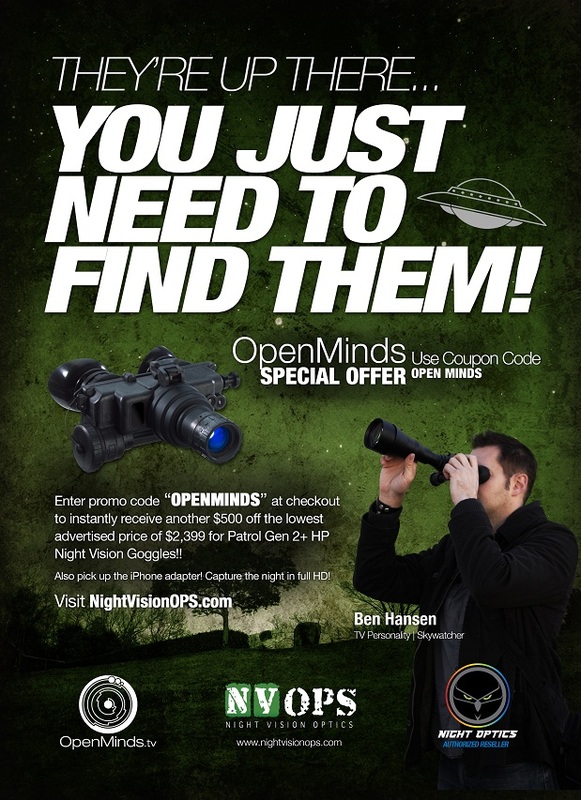 Hansen will also be leading a night vision skywatch at the 2015 International UFO Congress and will have scopes for sale throughout the duration of the event.